Baby K came to visit me at my home studio for his 6-month milestone photo session. 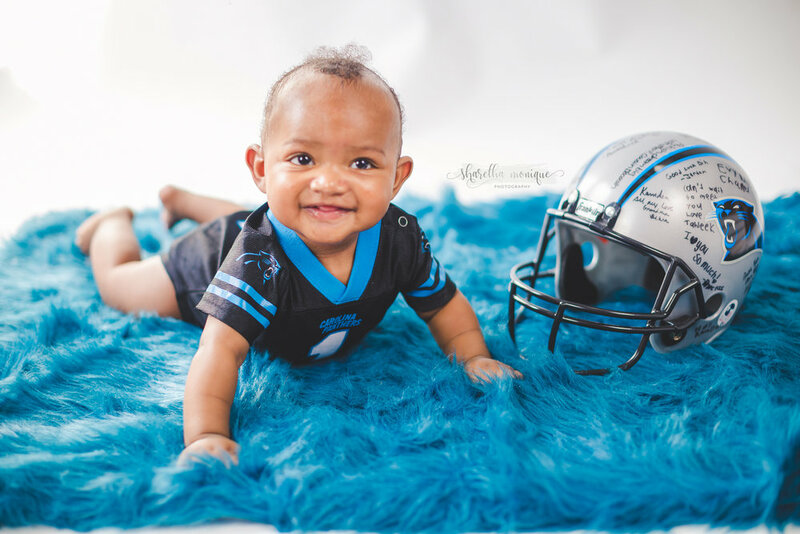 His parents are huge Carolina Panthers fans and thought it would be great to base his photo session around that. I couldn’t agree more! Isn’t this setup the cutest?! I had the best time snuggling this little cutie and his parents did a wonderful job of interacting with him behind the camera to get some great smiles! Here’s a sneak peak of his 6-month milestone photo session. Baby K was such a joy to capture for his 6-month photo session! I can’t wait to complete his gallery and celebrate the next milestone with him! Do you have a child or baby that you’d love to plan a special photo session for? I’d love to chat with you! Contact me for more information.